The Eddie Izzard Story is one of the strangest comedic and moving experiences that I have had the pleasure of watching. This tale of course, involves the life and times of Izzard in what could be best described as a biography as we hear his story from his birth in Yemen to his international climb to fame. This "biography" is also written and directed by Sarah Townsend (Diva 51), the former girlfriend of Izzard who is actually quite objective in her story telling as opposed to the scorned women that may have happened after a relationship breakdown. 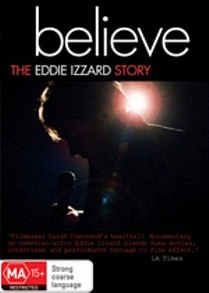 Although the story is an in-depth view into the life and times of Eddie Izzard, being a comedian is not all fun and games and this is highlighted in the story such as his fraud conviction in 2000, growing up in Northern Island as a foreigner and the unfortunate death of his mother from cancer. There's several quite moving scenes here. It's also an insight into how the mind of Izzard works as he attempts to find humour in some of the most unexpected places. Even if you are not a fan of Izzard, it's a very interesting journey of this comedian turned actor and is actually quite insightful at times with themes of sadness, happiness and more importantly normality. Featuring a variety of footage of Izzard, including home movies and stand-up performances, the video quality of this release is a little bit of a mixed bag but at the end of the day, it is quite acceptable. Audio is Dolby Digital 2.0 which is a staple of most documentaries and there are no complaints here. For extras, there's some interesting segments that include commentary, bleeped audio track, teddy theatre, the photograph, Vince Henderson Interview WWII: The Sequel Promos, The Amazing Captain Keano Wolves Sketch and finally The Eddie & Rob Show. These extras lean more on the comedic side that is actually a refreshing change from the main movie which can be quite emotional at times. In the end, The Eddie Izzard Story is quite a powerful documentary about this comedian and if you have never heard of him before, you will most definitely be shocked about this sometimes self confessed transvestite and at times a turbulent individual who is more normal than super star. Thumbs up for Sarah Townsend for creating such an emotional and engaging documentary.